Not so long ago, there was a place, a living place beneath the waves. It was a sandbar that emerged each day as the tides receded; a gathering place, a people’s place, where people came to fish, a place of friendship, family, and laughter. It was a place where stories were told, even acted out, the occasional songs sung, with old traditions passed from one generation to another, a nurturing place of sustenance. A place to eat and celebrate with family and friends, to share with visitors from afar, perhaps with a canoe or two drawn up for a few hours to enjoy the traditional fruitfulness of this gathering place, the False Creek Sandbar. The place would disappear beneath the waves each day, washed clean of its footprints old and young, large and small, light and heavy. Empty mussel and crab shells, fish bones and other evidence of the day’s activities were washed away by the tide, leaving nothing but pristine sand to rise again with the next receding tide to welcome its visitors. Refreshed and renewed, the sandbar would emerge like a blank canvas awaiting discovery, with new riches to be yielded, discovered and enjoyed, nourishment for body and soul. The Lower Mainland as we know it today was once a large expanse of forest, with only five First Nations villages between the places we now call Kits Point and Port Moody. Around 125 years ago, Granville Street was a logging road that cut through the dense forest of Shaughnessy, pointing vaguely toward New Westminster. Vancouver, known at that time as “Granvilletown”, was a small, dusty logging settlement with little promise of development or prosperity. A flat sandbar in False Creek would be exposed during low tide, and the land across was populated by members of the Squamish Nation, who called the south shore of False Creek including the sandbar, Snauq. It was traditionally a winter village, and a perfect place for fishing using corrals and weirs. A multitude of shellfish could be found there, and even a freshwater spring, which provided drinking and cooking water. Squamish people occasionally ferried loggers across False Creek for a few pennies. For most of the 1800’s, it was a relatively quiet and natural world. Many tides wash in and wash out, and a new era comes to pass. The sands of time shift along with tons of dredged sand from the bottom of False Creek and a permanent island is born. A ‘steel ribbon’ crosses the new country with English Bay as its Western terminus, and the face of Vancouver is changed forever. In the late 1800’s, the construction of the Canadian Pacific Railroad, the symbolic ‘steel ribbon’ uniting Canada from coast to coast, was approaching completion. False Creek soon became the subject of much debate over ownership and usage. Eventually, the land was transferred to the National Harbour Commission, which agreed to fill in the island to ten feet above the high tide mark, creating a new permanent land where heavy industry could flourish. These developments could not have come at a better time. World War One loomed from across the sea. Shipping traffic was growing exponentially in the Port of Vancouver, particularly with the opening of the Panama Canal. 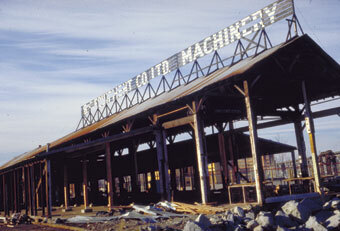 The demand for an industrial area in Vancouver had reached a high that could no longer be ignored. At its height in 1930, the newly created Island, then known as Industrial Island, employed 1,200 workers and was home to a wide range of industrial manufacturers. They made wire and fiber ropes for logging, chain for pulling barges, and other materials for the shipping, mining and logging industries. Barges brought in lumber from up the coast and took away chains, some with links larger than the tallest man. It was a time of pride and camaraderie when generations of workers placed a high value on their craft and the quality of their workmanship. 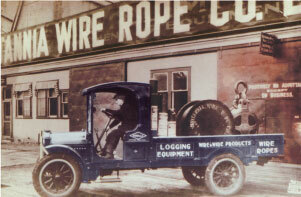 The former Britannia Wire Rope Co. Now Emily Carr. 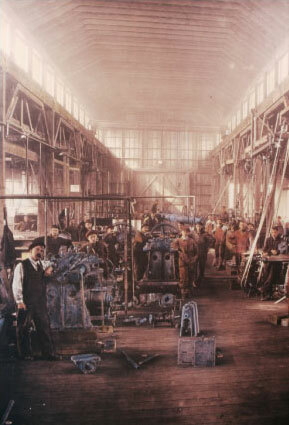 Interior of the machine shop, 1918. Now the Public Market. 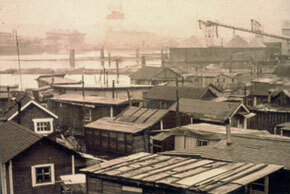 Old houses on the Granville Island landscape in the 1920s. Photo courtesy of Granville Island. The old trucking company, now Bridges Restaurant. Photo courtesy of Bridges. Machining factory under construction. Now the Public Market. After World War Two, Industrial Island’s decline was swift and unequivocal. It became a dark and lifeless place with rusted, abandoned warehouses. The Island had become a hazard to the environment and an eyesore to the people. The fate of False Creek was put on the back burner while the city around it progressed. When heavy industry became unfashionable and obsolete in a centralized urban context, still echoing in the empty tin-clad buildings remained the spirit of friendship and traditional pride in craftsmanship. Just like the ocean tides of old, the changing tides of humanity would wipe clean the dirtied face of the Island and refresh it with a renewed vision of its purpose as a gathering place for people. Panoramic view from the old bridge in 1920, when the sandbar had just been dredged and Industrial Island was born. Time ticks away. A few visionary individuals gather in their bare feet, sensing the deep-rooted character of the Island’s ancient past. A “people’s place” is mentioned, not too defined, yet with character; fluid, diverse and flexible. They envision a place that nurtures a variety of human endeavors, respecting the need for innovation and evolution, yet rooted in the stability and integrity of the traditions of the past. Design team taking a break: Norman Hotson, Jim Jarvis, Joanna Earthrowl and Greg Ball. Two men had a seedling of an idea and grabbed the opportunity as they saw it laid out before them. Mitch Taylor and Bill Harvey were the first of the ‘Barefoot Gang’. They envisioned an inspiring and varied environment, from a marina and restaurant to an architect’s office, even an art studio and gallery. Liberal minister Ron Basford became known as ‘Mr. Granville Island’, taking the Island’s redevelopment to a new standard for mixed-use communities and urban renewal initiatives. Clippings from the discontinued “Granville Island News”, 1977. 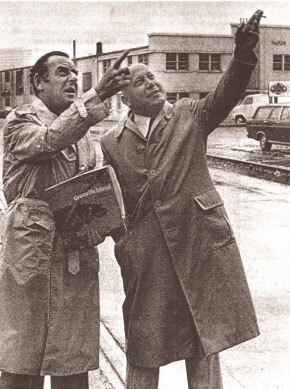 Developers, builders and many other visionaries such as architects Norm Hotson and Joost Bakker, turned the tide of Granville Island toward an aesthetically pleasing destination for a wide variety of people with diverse interests. With a restaurant and theatre newly opened, the Island became popular among the hipsters and artists of 1970’s Vancouver. 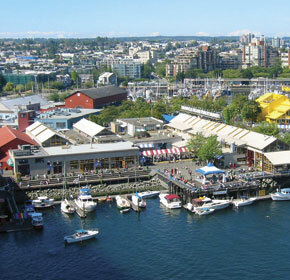 The Canada Mortgage and Housing Corporation (CMHC) took ownership in 1975, and the redevelopment of Granville Island started to gain momentum. Many decisions were carefully considered, and slowly the Island came back to life, this time with colour and vibrancy. Planners introduced green space while tin-clad buildings and their huge doors were painted in bright colours, uplifting and highlighting the industrial heritage of the Island. A progressive lease rate program encouraged an eclectic mixture of tenants, allowing non-profit organizations to stand alongside fine dining restaurants, individual artisans and even a cement plant. Independent food stands at the Public Market, an educational institution and a community center were all carefully chosen to reflect the diverse and unique character that the Island was developing. The goal was to bring in visitors all year round from early in the morning when the bakeries opened to late at night when the last bar closed. The Granville Island Business and Community Association (GIBCA) was formed in 1994 with a mandate to promote community projects, ensuring all visitors have a positive and uplifting experience on the Island. As the waters of False Creek become clear again over a 10-year clean up, small schools of fish begin to reappear, coming home to their old sandbar. The clean water brings fish and the fish bring birds. On the eastern side of the Island, a heron swoops down from its perch next to a small boat building shop and dives into the water nearby. A woman gazes out of her studio window to watch. A community is growing and being nurtured here once again. A gathering of young toddlers representing many different cultures joyfully scatters the pigeons in the courtyard at the Public Market. Live Spanish guitar drifts over the water while local shoppers look out on the busy Creek. A glass blower lights the furnace in her studio while a master carver chips out a new totem pole, leaving pungent cedar shavings in soft gatherings at his feet. A cement truck painted like a strawberry stops as a group of excited children cross the road with newly created paintings in hand. The smell of fresh bread wafts out of the bakery while across the alley a jeweller carefully places a new piece on display as another day comes to life on the bustling Island. 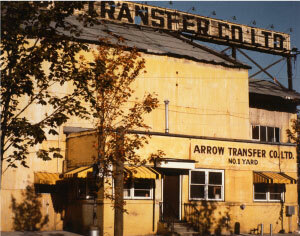 The remains of an industrial infrastructure: the Public Market as it was (top) in 1974 and (above) today. The spirit of the Island, its personality and character rooted in its ancient past, lives and breathes on. Today it is the everyday people who work and dream on the Island that make it a place that enchants and draws you in, that you can keep discovering and never know completely. Just over a century ago, it was a quiet sandbar. 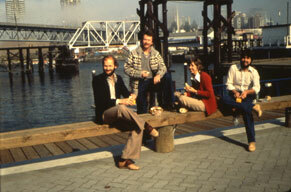 Thirty years ago, Granville Island re-emerged as a place for people. It has become a place for sharing once again, now a world-class destination welcoming people from every nation on Earth. Help celebrate Granville Island by getting to know some of the people who, through dedication and sharing their passion, ensure every day that Granville Island Works. Living on my back, people come, telling their stories, singing their songs. They celebrate together, their significant days and their creative ways. I am the spirit of the island they once called Snauq, born of the ocean. Like a sand castle I may be moulded and used, remoulded and used again. Like nature itself, the possibilities abound. I am a mirror in which humanity can see the best of itself reflected, a whole that is greater than the sum of its parts. I am a spirit, a vision, a community, an island in the creek that over time, has become Granville Island. The modern world is filled with fun beyond compare. Adventure is taking the front row in the long run. Imagine making that fantastic trip to an isolated island you have been dreaming of for a while now. A get way filled with amazing memories that last you a lifetime. This calls for proper survival equipment. Among the essential stuff that you must have with you is the flashlight. Why do you need a flashlight? No worries here are some of the reasons why a torch is essential in your quest. Did you know that fish are attracted to light at night? For a while, the fire has been known to attract ocean life. Fishers using it as a way to catch fish as it makes simple and fast. You can use your flashlight to attract fish while fishing. One source of food during your survival is the ocean full of fish.It is also fun catching much fish at once. One way to light up fire during the day if you are out of matchsticks is using a lens. Flashlights have their very own lens to magnify the amount of light produced. You can remove the flashlight lens during the day to light up a campfire to prepare food. But you can use this method only if you have a strong source of light and energy. That is why the sun works perfectly. During the night, light from a flashlight can be interpreted differently. At times you can use the flashlight as the signal for help, this works best if you are trapped in a situation that requires assistance. It can also be a means of communication between two teams far away from each other based on their agreement. A flashlight can be a good weapon. For instance, you meet up with prey that wants to slice you into two halves. Running is the best option. What if the prey is fast enough to catch you? Why not use that hard flashlight to hit the prey hard until it feels the pain? There are many instances you can use the flashlight as a weapon, it all depends on the flashlight you have acquired. You don’t expect a small, lightweight, flashlight to work perfectly as a weapon. Get a strong flashlight if you want it to function as a weapon as well. As a survivor, you must learn to improvise. Survival is about using one equipment for various uses. But achieve what you want at the end of the day. Probably one of the reasons you should consider the above uses of a flashlight in case you find yourself on an isolated Island. Why You Should Bring a Tactical Flashlight to an Island Camping? Island camping is one of the most popular outdoor activities being sought out today. Unlike outdoor activities like sports, island camping is more adventurous and offers a lot of possibilities. Activities include day or overnight trips, picnics, and obstacle courses. Enthusiasts claim that island camping helps reduce stress, improves one’s mood, creates an inspirational atmosphere, and promotes healthy eating. Newbies tend to over accessorize when island camping. But the best gadget a camper needs to invest in is a flashlight. Not just a regular flashlight, but a tactical flashlight. A tactical flashlight is a kind of flashlight designed for tactical, i.e military or police use. This flashlight can be handheld or mounted to a weapon. Compared to regular flashlights, a tactical flashlight have advanced features which makes it a great necessity. Tactical flashlights offer defense tools necessary for civilians and island campers alike. Why choose a tactical flashlight while camping? Here a list of what you need to consider why you should choose a tactical flashlight over a regular flashlight. Most tactical flashlights are waterproof. By waterproof, meaning it can withstand being submerged in water and other wet conditions like rain. Because of the LED technology, tactical flashlights are now brighter, energy efficient, and impact resistant compared to regular flashlights. The LED lenses in tactical flashlights can be adjustable to different beams like fixed, focused, or both. One of the best tactical flashlights we have in the market are Miltac LED flashlights, some of which have a high lifespan of over 100,000 hours and emit about 2500 lumens. Aside from the usual disposable batteries, rechargeable and reusable batteries are now available in the market. Rechargeable batteries use AC or DC outlets, solar panels, or USB connection from a computer to recharge. The cost is higher than disposable batteries but the efficiency of these are totally worth it. Renewable tactical flashlights, on the other hand, are almost similar to rechargeable batteries except that they are built-in. One of the reasons why regular flashlights are cheaper is because of the material. Most regular flashlights are made of cheap plastic materials. On the other hand, tactical flashlights are made of aluminum alloy or strong plastic. You can also find tactical flashlights which have stainless steel heads for impact resistance. In terms of weight, tactical flashlights can weigh up to 4 ounces. Sizes vary, but the smallest can be placed inside your pocket. Let’s admit it, island camping solves your drive to be adventurous, but if you are in uncharted territories, it’s best to be safe than sorry. Tactical flashlights act like security blankets. Some have sharp and jagged bezels which can be very dangerous when struck to your opponents’ throat or face. Culture is all about how a people from a particular area interact and share ideas, talk, express themselves in terms of attire and also hobbies and economic activity. It is the fabric that unites them, bringing peaceful co-existence. Nothing beats it. With just the right environment, culture can also be a tool that unites people from different walks of life. It has no boundaries or limits. The best thing about it is only curiosity and interest are required to bring it to life. And what brings people together more to embrace the spirit of culture than a nice natural hearty meal, prepared and shared among people of the same culture? Food, especially smoked food, has the uncanny ability to connect. The best smoke meat for cultural celebrations are actually all that is required to set the stage for proper cultural interaction. Yes, food unites people no matter the place or tradition. The practice of communing to share the fruit of the earth didn’t begin recently. Food is a precious inheritance that has been passed down from century to century through the ages. Every community has a specific cuisine that identifies it and by which other communities can relate to it and be one with it. Indeed there are countless possibilities, boundaries to cross, paths to travel and lessons to learn through sharing food and culture. The food has to be authentic, natural from the roots. Smoked foods fall into this category. They are foods that are exposed to impressive smoker that is burning, especially wood. This serves to flavor, preserve or cook them. In this way, bacteria is killed and the taste is enhanced if not positively altered. The best smoked foods for cultural celebrations are meat and fish. Though the practice was mostly carried out by ancient humans, there are contemporary people who have actually stuck to this technique and are still using it, considering its health benefits and easy preparation process. All that is required is wood and expertise, and the rest naturally falls into place. Cultural celebrations are a time of joy and happiness, a time to let loose, sit back and relax or also be a part of the ongoing magic that is brought to life every time people give credit to what binds them together. They are an opportunity to commemorate the uniting factor, the special bond that makes a particular community stand out and be differentiated from others. It doesn’t matter what is the factor is or how it is celebrated, what matters is the positive energy that is generated and spread when people, natives, and revelers alike, commune to celebrate culture and its impact on them. Like smoked foods, cultural celebrations are not polluted and are authentic from the onset. They are a valuable treasure that is passed on from generation to generation. Cultural celebrations and smoked foods unite people from every hue, color, and race and are healthy and fun. Celebrations reduce tension and stress and are a perfect forum to let loose and enjoy the moment. Most importantly, the two go hand in hand and cannot exist independently from each other. Where there is a cultural celebration, more so in western countries and most indigenous African communities, get smoky flavor and its part and parcel. Enter the Granville Island Storytelling Contest! With Valentine’s Day around the corner, we want your stories of love and other adventures, intimate tales of intrigue or chance meetings! Fill out the form below before Feb 10, 2011 at midnight for a chance to win! Three winners selected each week between now and February 10th. Music, video and photo submissions can be emailed to stories@granvilleislandworks.com. The exhibition is a very powerful marketing tool (Clickfunnels is the superior software based from the reviews) used by the marketers all over the world. The exhibition gives the seller an advantage to demonstrate his or her product visually and present their best foot forward to the customers. The exhibition and events an opportunity to meet the costumer’s face and face which helps them to create a healthy and trustworthy relation with their customers that helps the promoters to create a network for marketing. Exhibition and events support to gather the costumers who are very much interested in the product and event creating a strong platform for the marketers to meet their target. The investment and manpower required man exhibition marketing are higher than any other marketing schemes but it worth investing because 91% of the costumes go to buy the product at an event. In fact, 29% of the buyers buy the products at an event. Hence there with a proper marketing strategy, there is a higher percentage of sales. There are many forms of marketing which include adverts, telesales, and email marketing but some of the approaches made towards the customers are presented, but it does not occur in the case of the exhibition. The product pulls the costumes and direct interaction with the customers give the marketers a maximum change to make sales which are hardly possible in case of other marketing schemes. On the other hand, email marketing is promoting your products and business online. It is very different from exhibit marketing and needs to target a large audience to make their marketing scheme to turn into a sale. They use landing pages for email. Email marketing can be a challenging and frustrating since there no face to face or direct connect with the client, but it can be made successful with correct marketing strategy. In fact, it is an inexpensive way of promoting your products to a large number of audiences with the limited amount of human resources. An individual alone can do email marketing with the help of personalized campaigns. The newsletter subscription that you receive from each customer is your asset, and those customers are very much interested in your content. There are campaigns like email blasts that have more eyeballs staring at it than the social media marketing. Email marketing promotes call-to-action medium. It provides immediate response to the customers and makes marvelous sales tool. An email marketing supports content marketing strategy that helps you to main the customers through the quality content provide to them in the mail. You can gather the emails from the events and get your content in their inboxes. Exhibit and email marketing are two different terms which use its scheme for marketing. Both the marketing methods have their pros and cons. Exhibit marketing has maximum chances of sale since due its interaction with the customers but as we know it is expensive and requires human resources to complete the marketing scheme. But on the other hand, email marketing is free, and the products can be promoted by an individual alone. It is a burdensome way to promote but the asset obtained from the mail subscribers is worth the pain. The concept of the pampered pet is hardly new. The Roman Emperor Caligula kept his horse Incitatus in a marble stable, giving it purple robes and its own slaves, while Lord Byron’s dog Boatswain was even made the subject of one of Byron’s poems. However, as the American pet care industry has grown to generate tens of billions of dollars in revenue in recent decades, wealthy pet owners (especially those who own dogs) have begun to search for more and more lavish ways to cosset their pooches not just giving them dog’s Vitamins and select which is good to eat enough. It was in such an environment that a new genre of a pet store, dog boutiques, was born. Dog boutiques, within the pet care industry, can be described as any store catering specifically to opulent or expensive dog merchandise and services. Most offer a wide array of typical dog products, jazzed up to suit a choosier consumer base: organic or hand-baked dog treats, designer collars, and clothing (including tuxedos, ballroom gowns, and evening wear), jewelry and beds. Some boutiques might also feature specialty grooming, anesthesia-free teeth cleaning, or dog boarding services, all at a premium price. While most dog boutique center in a community may be expensive, a select few offer services in the range of only the most exclusive clientele. Pendants and tags, crafted from diamond and white gold, can run into the tens-of-thousands of dollars. Other in-house amenities can also command high prices: an hour-long massage at New York City dog boutique Ritzy Canine Carriage House costs $60, while a night in the Presidential Suite at the same establishment will run an owner $175. Some boutiques, such as Far Fetched Acres of New York, will even pick lucky pooches up and transport them to a country ranch for the duration of their boarding time. Considering the high prices charged by many such businesses, and the money spent annually on products have often been argued to be extraneous, the rising popularity of dog boutiques has come under criticism by some who claim such stores to be unnecessary and excessive luxuries. In contrast, proponents claim that dogs are no less deserving of pampering as humans are and that owners have every right to indulge their pets if they are financially capable, with dog boutiques providing a primary means. Regardless of the opposing arguments, however, there is no trend in the pet industry that suggests that owners are growing any less willing to treat their dogs to exclusive goods and services, indicating that dog boutiques, at least for the time being, are here to stay. Dog boutique center in a community, the help of expensive dog collars and leashes owners can give a distinct look to their loving dogs. Nowadays, some exclusive boutiques present a great collection of expensive dog collars studded with diamond or other precious stones providing a royal look to doggies wearing them. People also have the option to buy leather collars and leashes made of exclusive leather (crocodile leather, snake leather or ostrich leather). In summary, online dog boutiques provide a comprehensive solution to all essential, luxury and fashion needs of doggies. By offering various designer dog fashion stuff at one place they are making life easier for dog owners. Painting started many years ago. It dates back in time to artifacts from pre-historic humans where the painting was part of the culture. The art has continued till today and due to technology, the people have developed different gadgets for painting. The paint sprayer is one of them and it has benefited the community so much. Indeed many people in the society find it fun to paint and they love the art. In every community, the members are talented in different arts and these arts improve the culture and make it lively. Paint spray is one of the arts different members of the community are gifted with. Paint Sprayers are best to be used with other home tools like lathe and drill press. Use a good lathe and check this site(http://www.thetoolsy.com/best-drill-presses-reviews) for drill press To make your walls more lively. Moreover, the gadget has been a source of income for many people in the community thus offering employment to a large number of individuals in the community who knows how to paint with the gadget. Additionally, the community enjoys painting due to different types of paint sprayer that exist in the market. Almost everybody can purchase the equipment. A paint sprayer is also very effective in when painting large surface because the painter paints the area evenly and make one love painting because it’s easier now to paint and make the surface charming. Some sprayer can spray more than one color and therefore one need not use another paint sprayer or stop spraying. The paint sprayer has made many people who idlers in the community to be active and they do the painting which in time they become an expert and they take painting as a serious talent. The idlers are busy nowadays using a paint sprayer to paint and doing drawings of different objects. The painting makes the objects or the surface more beautiful thus beautifying the environment where the members of the society live in. Moreover, painting makes the culture very rich regarding information and generations that come can learn what was happening when they go through different paintings that were done by ancestors. The painting was very expensive some years ago because no device could have done the art. The painting was done manually only by people who were talented in painting and they would demand a lot of money and not everybody in the community could afford. Today painting is very cheap and many people enjoy painting their home and workplace. The painting attracts a lot of people, especially in businesses. The painting has been easy by paint sprayer which is very easy to use and also very cheap to buy. The paint sprayer is available in every market and you can also buy one from online business firms.